I've also added an Neofinetia/Fukiran division list. pre-orders for orchid society speaking engagements. A truly spectacular species. The plant flowers in the winter with multiple spikes of 25-30 flowers each! Best grown in a pot or basket. A very cute miniature growing Aerangis species. It flowers in the spring with several spikes of 2-3 flowers each. The grandaddy of most "Brasso" hybrids. The lip is heavily fringed and the flowers are very fragrant at night. A wonderully spotted Cattleya species. This one flowers several times a year! This is the rare coerulea variety with a blue lip. Best grown mounted or in a basket. This form has a purple rim around the lip. Can flower 2-3 times a year. A true micro mini! The queen of the Cattleyas. Huge flowers up to 7" across. It can flower with up to 5 blooms per spike! Very select alba parents. An extremely fragrant clone with bright yellow flowers. This is a must-have plant! 4" pot Lovely pendulous spikes in the late Spring. Needs a dry winter rest. ​Wonderful terrestrial tuberous species with fringed flowers. 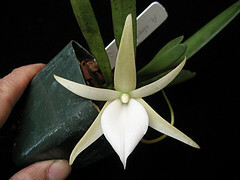 This is the rare alba form of the spectacular Laelia jongheana. One of the rupiculous Laelias. These are seed grown and well established. A Cattleya relative that is very easy to grow. A miniature species that can form specimen plants easily. Can be grown mounted or in a pot. My hybrid of M. braebonae x capense. Wondeful easy bloomer. A wonderfully exotic species with a forked red lip. This dwarf vandaceous plant is temperature tolerant and flowers in the summer. An easy to grow Sophronitis species. Best grown mounted. Flowers in the winter. A bright pink clone of Neofinetia falcata x Asctm. ampullaceum with very round flowers. Can bloom with 3-5 spikes! This is imported from Japan. This new clone uses the spotted form of Rhynchostylis crossed with Neofinetia falcata. Nicely fragrant. A dwarf intergeneric hybrid between Rhyn. gigantea x Holcoglossom flavescens.